Do you have a friend who is coming to visit for the weekend with their dog? How about making the dog feel at home just as you would make your friend feel at home? It’s such a simple and thoughtful idea and it’s so easy to do! And we all know, easy is good! Just follow these few steps and you’ll be on your way to being the best hostess a dog could ever ask for. Pick up a new dog toy for your doggy house guest. This is a fantastic idea especially if you have a dog of your own and he has already claimed and broken in his toys. 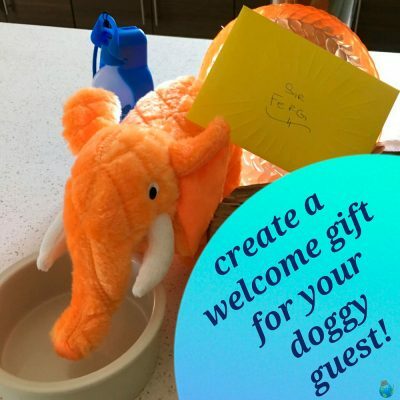 Get the doggy guest his very own water and food bowl. Who likes to eat from another person’s plate? Having his own place to eat will make him feel less territorial if there is another dog in the house too! Treats are always good! You want the doggy guest to be acknowledged for good behavior, like going to the bathroom outside and not begging at the table. Check to make sure the dog doesn’t have any allergies or sensitivities first. Have a backup leash in case your friend forgot to bring one for their dog. You never know where you may end up with your house guests and some places may require a leash. We know some dog beds can be very expensive so this idea would be a step above and beyond! It may be worth the investment if the dog will be coming to visit regularly with your friend. If you don’t decide to invest in a bed then dedicating an area of your home to the doggy guest is a good option too. If the doggy guest is feeling stressed in the new or overwhelming environment then he can retreat to his/her “spot”. Lastly, write a welcome note to express your excitement to welcome your friend and dog into your home. Mention any “house rules”, tell them where treats and food can be found, and inform them of any local dog friendly locations.